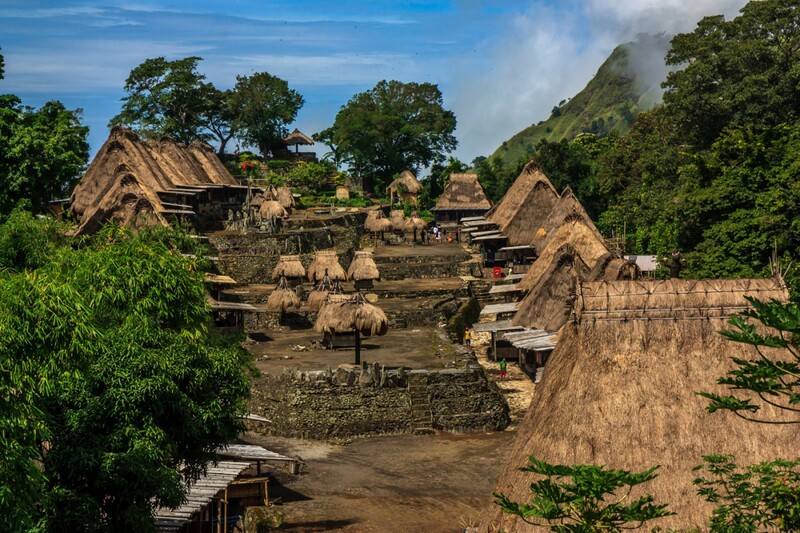 The reason to spend some time in Bajawa, Flores, Indonesia, is to visit the nearby traditional Ngada villages. And the star attraction of them is Bena Village. 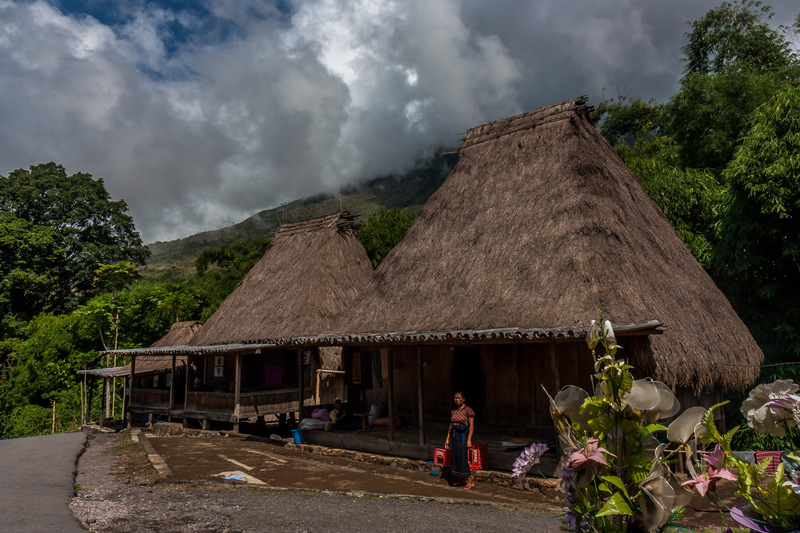 I had visited some traditional villages on Bali, and did not enjoy them. The residents constantly pressure the busloads of tourists to buy stuff. I never bothered to blog about them. Bena was not like that. 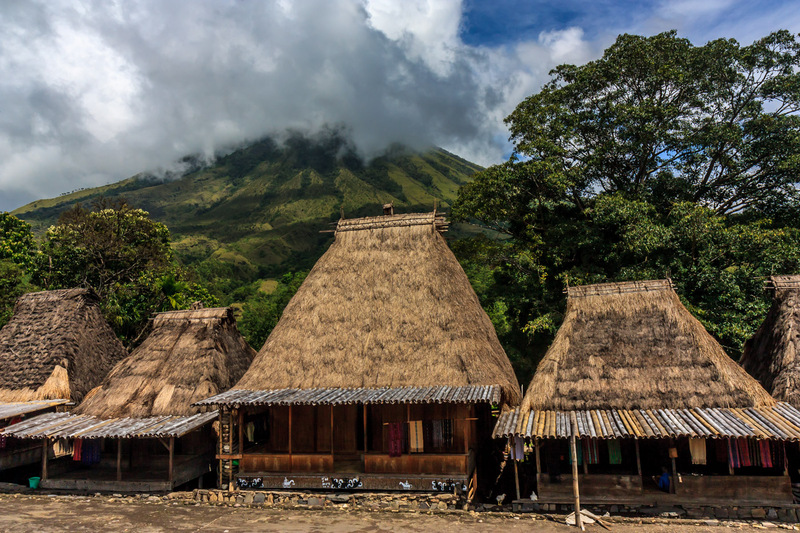 While there were some tourists visitng, this is remote Flores, not Bali. Not that many tourists make it here. The locals had items they were selling, but nobody pressured me into buying anything. I certainly like buying stuff to support the locals, but I don’t like to be harassed. This friendly lady spoke a little English. Bena Village was really incredible. It almost seems like a movie set, but people actually live in this spectacular place. Nestled on the slopes of the volcanic Mt. Inerie, Bena consists of a long central courtyard, with multiple levels. 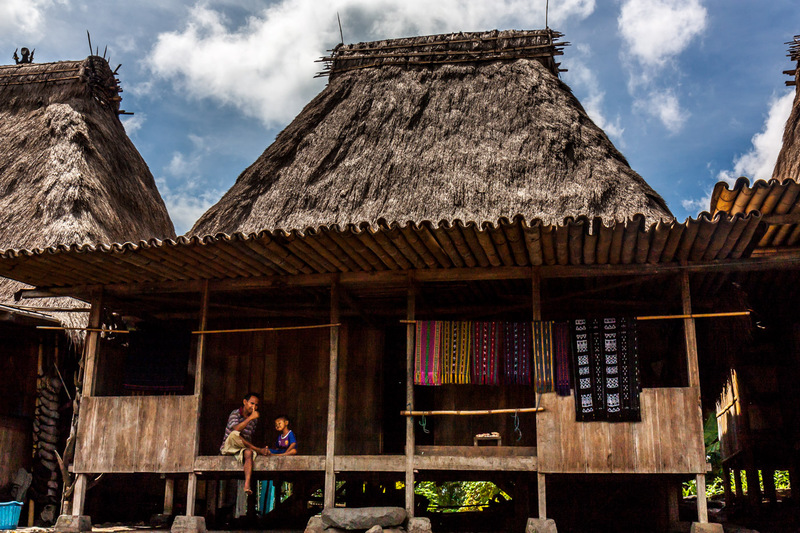 In this public space are the distinctive features of all Ngada villages. There are the parasol-like ngadhu, made of thatched wood. These are male aspects. For each one, there is a corresponding female bhaga, which looks like a little house. Looking down at the village. 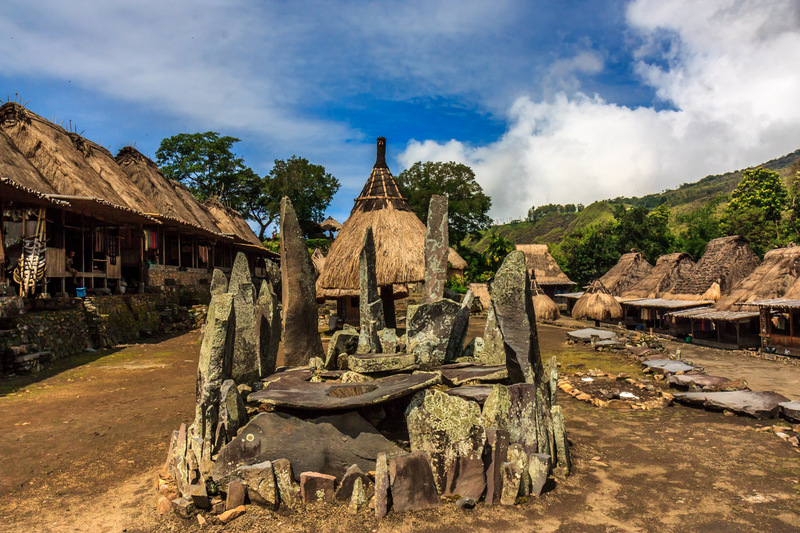 The villages are always described as “megalithic” because of the stone monuments in the courtyard. Surrounding this long courtyard are the houses themselves. 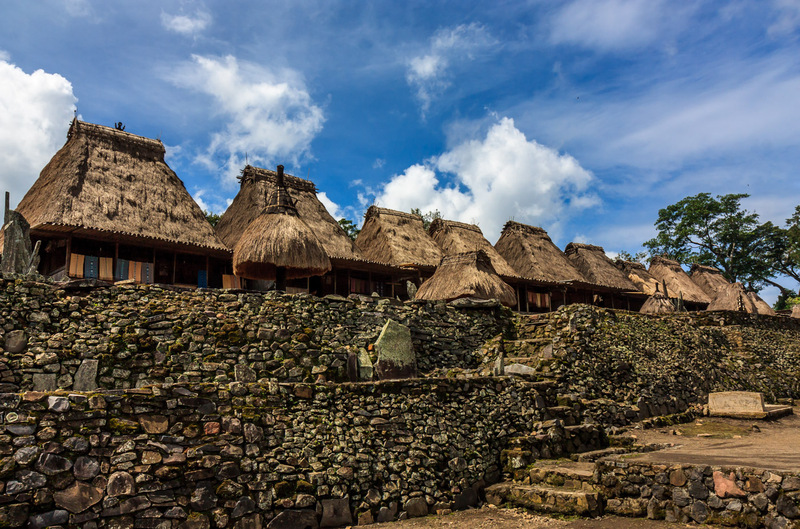 They have distinctive tall, thatched roofs. Many houses have carvings of animals, indicating status. Women sit on the porches weaving. Men do various jobs such as laying out macadamia nuts to dry. They sell the nuts, and I bought some. 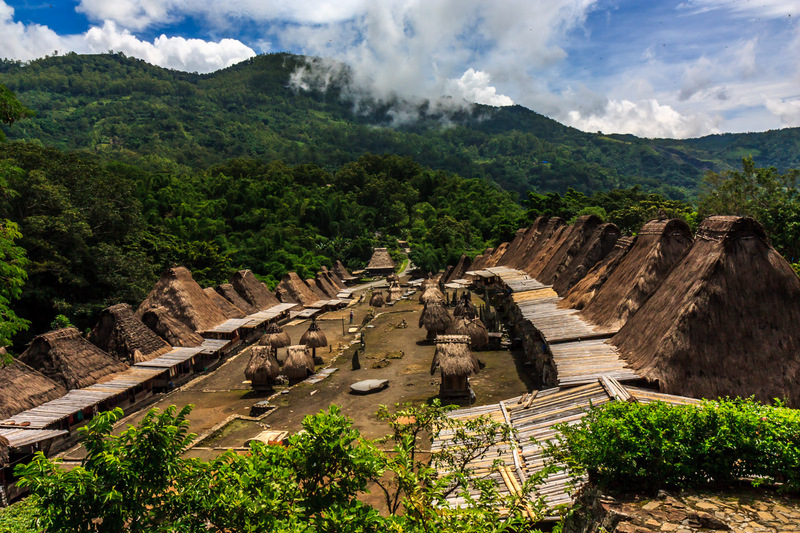 These traditional folks don’t speak English, so a little Indonesian goes a long way. I came without a guide, so didn’t get a lot of the insight a guide would have provided. But it forced me to engage with the locals, despite language limitations. They were quite friendly and welcoming. The few tourists that passed through rushed through the village, took some selfies, then rushed off to the next village. Why the hurry? There’s only a few villages, so there’s plenty of time. Get an early start, and spend some time at each village. Get to know the people there. I liked Bena a lot. I stayed for hours. I stayed so long they cooked me a simple lunch of fried rice. They gave me a snack of boiled bananas with papaya leaves, which I guarantee you won’t find in any restaurant. After I ate they showed me where I could take a nap. The weather changed and I saw the village in the rain, then the fog. It was an incredible experience. It’s possible to spend the night here, and it’s not expensive. 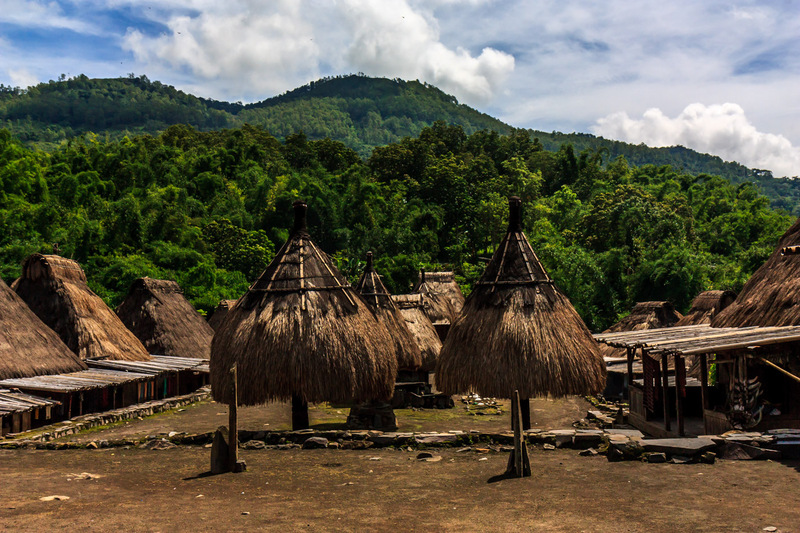 Bena village is one of my favorite places in Indonesia! Thank you for your article, it’s a really useful one. You wrote that is possible to spend the night there. Who should I ask? Do I need to book it in advance? Just show up and be friendly. These are low-tech people without computers so you can’t book.